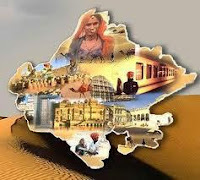 Rajasthan GK Question in Hindi Sample Paper 176: Rajasthan General Knowledge Sample Question Paper with Collection 10 Question of Rajasthan GK Questions for RAS, Rajasthan Police, REET, SI, Contable, Patwari and other state exams under GK Quiz in PDF @ Rajasthan GK Sample Papers. Rajasthan General Knowledge (GK) and General Studies (GS) Questions from various examinations of Rajasthan Govt. and central Govt Examinations. Q.3381 प्रधानमंत्री नरेंद्र मोदी ने 6 सितम्बर को किस मेट्रो लिंक सेवा का उद्घाटन किया ? Q.3382. संथारा की धार्मिक प्रथा (सल्लेखना) किस समुदाय से संबंधित है? Q.3383. 'खेजड़ी' और 'बबूल' प्रकार की वनस्पति की प्रधानता राजस्थान के किस क्षेत्र में अधिक है?